Looking immaculate after her spell in the Garvel Drydock, the paddle steamer WAVERLEY berthed at Customhouse Quay while she prepared to go on sea trials following her annual survey. 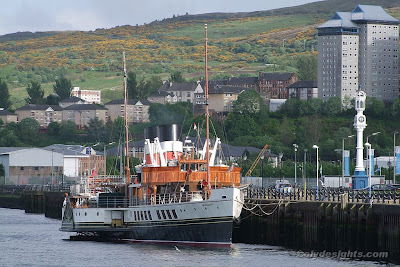 Her summer season commences a little late this year, when she sails on Friday for Oban, and a weekend of sailings from the West Highland resort. The magnificent cast iron beacon and clocktower on the quayside was made in 1860 at the Eagle Foundry in Greenock by Rankin and Blackmore, Engineers, a company later renowned for building steam machinery including the three crank, triple-expansion, main engine installed in WAVERLEY in 1947. Another great shot and looking forward to seeing her too.